Animal Welfare: A New Shorter Course—and It's Free, Too! Hendrik Nollens, DVM, SeaWorld's corporate vice president of veterinary care and welfare, contacted the San Diego Zoo Global Academy last year with an interesting request. Dr. Nollens was interested in creating a shorter version of the Animal Welfare Professional course. His desire was to educate all of SeaWorld's non-animal care employees about animal welfare. Dr. Nollens envisioned a 20-minute course drawn from the original two-hour version. We were encouraged and excited by his desire to educate all of SeaWorld's staff about animal welfare on SeaWorld's private Academy site. The Academy contacted Lance Miller, Ph.D. at the Chicago Zoological Society, who was the primary author of the original version of the Animal Welfare course, with Dr. Nollens' idea. Dr. Miller, who is also the current chairperson of the Association of Zoos and Aquariums' (AZA) Animal Welfare Committee, was enthusiastic about the idea. A focus of the AZA's Animal Welfare Committee is to advance animal welfare and the science that supports it to the widest possible audience. The only stipulation was that in the process of creating a shorter version for SeaWorld's general audiences, none of the original course's wording would be changed or modified. Dr. Nollens set to work, and produced a condensed version of the course for general audiences that is 20 minutes long—and it is outstanding. The original idea was that the course would be exclusive to SeaWorld's Academy site, and for their employees only. However, the Academy was so impressed with this new product that all of us—at SeaWorld and the San Diego Zoo Global Academy—felt that it should be shared freely on the San Diego Zoo Global Academy site. In December, Dr. Nollens' version was shared with the San Diego Zoo Global executive team, and they gave their unanimous approval to make the new short version accessible from the Academy's website. Now, the Academy is excited to announce that this new training tool is available to all our subscribers. The new 20-minute version of the Animal Welfare course is included in the "Free" section of the Academy's website. If you are an animal care professional, we invite you to check it out, and then share it with your director. The Academy believes that this new version is an excellent resource for sharing with non-animal care staff, teaching important information about animal welfare, the science that supports it, how it is measured, and the processes for ensuring good welfare for all animals. We highly recommend sharing this course with any employee who interacts with the public, at any institution. Importantly, the new course was created using software that makes it viewable on any device, including smartphones, tablets, and desktop computers. This month, the new course is being been translated into a Spanish language version, so please watch for that coming soon, as well. The Academy would like to thank Dr. Nollens and Dr. Miller for their vision in bringing this important course to a much wider general audience. For questions related to this article, please contact Gary Priest, San Diego Zoo Global Academy, at gpriest@sandiegozoo.org. San Diego Zoo Global Academy Puts Safari Niagara in the Spotlight! Safari Niagara in Fort Erie, Ontario, Canada, is part of the Academy's collaborative learning environment! Please join us for the Administrator's Users Group Webinar, hosted by Academy partner CypherWorx. The next webinar is Wednesday, March 20, at 11 a.m. Pacific Daylight Time. Keepers, interpreters, guides, and docents can explore the fascinating lives of reptiles as the San Diego Zoo Global Academy presents three new modules in Introducing Animals, our series about animal species and taxonomic groups. The Reptiles course content is divided into three modules, which allows for a more focused approach to the material, as each is narrower in scope. Each module includes self-assessment opportunities and its own mastery test. Another benefit of the new Reptiles modules is that they are designed to run on your desktop computer, laptop, tablet, or even your phone—anywhere you have an internet connection! Reptiles 1 explores the physical characteristics, distribution, and habitats of reptiles: snakes, lizards, turtles and tortoises, crocodilians, and tuataras. 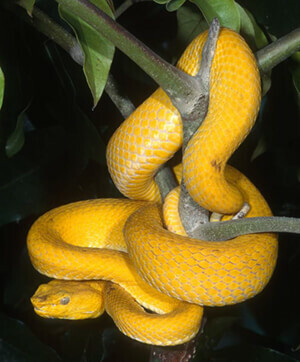 In Reptiles 2, learners investigate what—and how—reptiles eat, as well as which animals prey on various reptiles, and how reptiles avoid being eaten. This module also covers thermoregulation, locomotion, behavior, and communication. The final course in this group, Reptiles 3, explores the fascinating world of reptile reproduction and investigates the conservation status of reptiles, threats to reptile species, and how conservationists are helping. The module concludes with a look at some examples of how we can all participate in reptile conservation. Remarkable images used in these modules show reptiles in ways you may not have seen before, and video provides insights into their behavior. Interactivity sprinkled throughout the modules engages participants in the learning process, and questions at the end of each section ensure that they have mastered fundamental concepts before they move on. Each one of the Reptiles modules takes about 60 minutes to complete, although participants progress at their own pace and may repeat the entire course or sections of the course as many times as they like. The modules can easily be integrated into your current training program. Providing online modules that team members can complete anywhere and at any time overcomes one of the major challenges of training: getting all participants together in one place at one time. At the San Diego Zoo and Safari Park, participants complete online modules on their own before attending group training programs. They are able to master key vocabulary and concepts, giving them a solid foundation that allows them—and their trainers—to make the most of in-class and on-site training. The modules are an awesome resource for interpreters, but they offer insights to veteran animal keepers too, providing a glimpse of natural history that helps keepers address husbandry concerns. The modules address common questions and provide an up-close exploration of what reptiles are all about. Whether you've worked with these animals for years or you're a brand-new interpreter or docent, the modules will equip you with a better understanding of these amazing animals. The three-part Reptiles course joins the newly revised, three-part Apes course in the Introducing Animals series. 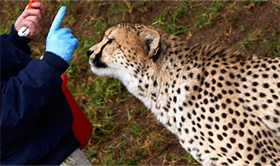 Other available courses are: Mammals, Birds, Giraffes, Rhinoceroses, Elephants, Cats, Old World Monkeys, Lions, Cheetahs, Tigers, Polar Bears, Giant Pandas, Orangutans, Gorillas, Kangaroos and Kin, Lemurs, Penguins, African Penguins, and Hamadryas Baboons. 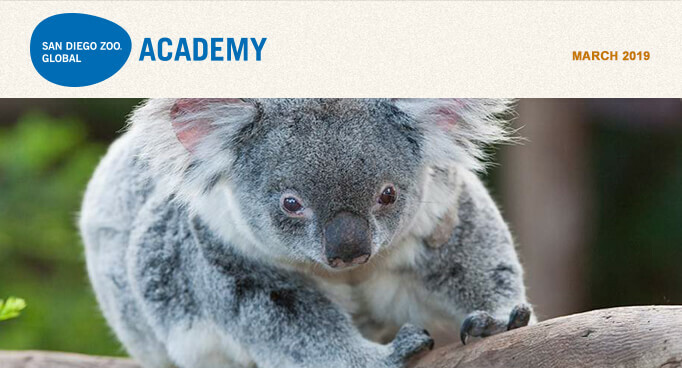 We're excited to share these courses with you on San Diego Zoo Global Academy. Look for a new three-part Monotremes series coming later this year! The San Diego Zoo Global Academy is pleased to have a content collaboration with the Servant Leadership Institute to share lessons and stories that can further enhance our mission-related efforts. That will include the opportunity for the San Diego Zoo Global Academy newsletter to share the leadership lessons and insights from former San Diego Zoo Global veterinarian Dr. Donald Janssen—the author of Upside-Down Leadership—the first of which is presented here. Preventing Conflict: A Message for "Animal People"
"I like working with animals better than people." I heard this admission from my coworkers many times during my career as a zoo veterinarian. These animal people would often say it with a measure of pride and conviction. I remember saying the same thing early on as a college freshman. I was attending Fresno State University and a member of the pre-veterinary club. The dean of the University of California, Davis veterinary school came to speak to us about zoo and wild animal medicine. It inspired me. At once I knew zoo medicine was what I wanted to do, so I couldn't wait to talk to him afterward. I hoped to say something convincing to show I'd make a good veterinarian. I got straight to the point and spoke with assurance, "I know I'm cut out for this because I like to work with animals more than people." The dean listened. He then responded, "You have to understand something right now. In veterinary medicine, you have to like people as much as animals. Otherwise, you will live in conflict, and the animals will suffer for it." Those words were a gift—a seed that has grown in significance over the years. Based on that bit of wisdom, I have found three principles useful for preventing conflict: 1) act with a servant leader mindset, 2) build trusting relationships, and 3) create role clarity. Here are practical ways to live out these principles. Focus on serving the needs of the organization and not on winning an argument. By serving the organization, we can achieve a higher and nobler cause. Be on guard against your ambition coloring your approach. Behave as an owner and not a "hired hand." Build and extend trust before issues of conflict develop. Animal behaviorists and trainers use a "trust account" with their animals. To support a surplus account balance, trainers must continually pay into it. The same is true with building and maintaining trust with our coworkers. A healthy surplus in that trust account allows us to maneuver through potential conflicts. Clarify roles that could lead to confusion and territoriality. People become threatened when they sense they are losing value or status in the workplace. Unclear roles may be to blame. Good leaders can spot oncoming conflict caused by vague roles and responsibilities. A role-clarifying exercise conducted among stakeholders can avert conflict and, instead, lead to synergy. Conflict is part of the human experience. We should not ignore it or avoid it. Yet, like the diseases we fight in our zoo animals and our own bodies, conflict is best prevented. Servant leadership teaches us we can immunize ourselves from most clashes by serving others, building trust, and clarifying roles. It may even make it possible to like working with people as much as we do animals! What is a potential source of conflict brewing in your life? What can you do today to prevent impending quarrels from damaging your relationships, and hampering your purpose in life and at work? You can send your thoughts on these questions to info@servantleadershipinstitute.com. For more information about this article, please contact Dr. Don Janssen at don.janssen@gmail.com. To keep ahead, each one of us, no matter what our task, must search for new and better methods—for even that which we now do well must be done better tomorrow. If people only understood the incredible power of a shift in perspective. To be different you must think, feel, and act differently. Change your perceptions, change how you feel about things, and then take action. Note: This is a brief adaptation of a February 13, 2019 lecture at the Aquarium of the Pacific, available for viewing here: http://www.aquariumofpacific.org/multimedia/player/lecture_archive_james_gesualdi. A video aquacast is also available at: http://www.aquariumofpacific.org/multimedia/player/james_gesualdi. Special thanks to Dr. Jerry Schubel, Linda Brown, and Dr. Sandy Trautwein for the first opportunity to share some of these ideas in a meaningful way. We live in a world where we can become preoccupied with "being right." This is especially true with regard to discourse about animals and related concerns. Being right is often good—particularly for our egos. It can be important, but fixation on being right can sometimes sidetrack us from the very things we cared about in the first place. I am certain that as a younger lawyer, and likely even more recently as a lawyer and a person, I have wanted to be right, be proven right, maybe even desiring to mutter, "I told you so…." When this attachment to being right descends into argument, our goals and interests may slip from view, and we may simply seek to be right and make someone else and their position wrong. Over the years, I have conscientiously endeavored to get over myself and my considerable ego (and this remains a work in progress). This effort has shown me that there is great beauty and power in shifting from being right to "doing right." For me, and those I have had the privilege to counsel, coach, or mentor, this "better way" has opened up great possibilities for advancement, as well as the one true path to moving forward from adversity and even tragedy. Making the shift to doing right within the zoological world and Animal Law (the two worlds I inhabit) involves, first and foremost, remembering that our work calls us to serve the animals in our care and their brethren in the wild, and to be mindful and protective of their interests and well-being. With that awareness, right here and right now, we are liberated from the limiting perspective of being right. It's not about us, but about the animals and the other people we can serve and work with, to elevate each other and better serve the interests and well-being of animals. One effective way to emphasize the importance of serving the animals entrusted to our care is through the application of the landmark Five Opportunities to Thrive developed by Greg Vicino and Lance Miller, Ph.D., which can be found in the Academy's Animal Welfare course: http://sdzglobalacademy.org/courseAnimalWelfare.html. The shift extends to how we engage each other. When we act toward each other—including (and especially) our critics—with compassion, dignity, and respect, we model a better world. This is a variant of the timeless and ever-timely Golden Rule, which we can apply to dealing with other people regarding animal-related matters. In some instances, this may not be possible, but in nearly all interactions and situations, it is a constructive approach to sustainable, transformative change. In the face of great adversity, this shift to doing right rather than being right means that we humbly accept responsibility for our own actions, discern the lessons before us, and put our hearts and minds to work to make things better. Having taken our egos out of the mix, our creativity and energy are free to identify, develop, refine, implement, and build upon improvement after improvement to enhance and protect animal lives. We can also help those people, like us, who work with animals in professional and personal activities. Good practices are designed to help make this shift, applicable anywhere and everywhere when we choose to make continuous improvement in animal welfare our overriding priority. You can find examples in previous Excellence Beyond Compliance® articles in the Academy newsletter: An Enlightened Caregiver's Creed on Serving Animal Interests and Well-being (June 2017), and Turning Challenges into Opportunities: the Principles of Constructive Engagement (November 2015). As I look back upon the last 30 years of service in making a difference for animals and people, I am even more energized to look ahead, even in the face of great challenges to this world of ours. Having made the shift from being right to doing right for animals, my days are dedicated to making a difference rather than mired in simply making a point. Together, each of us can make the shift from being right to doing right, and bring more goodness and light to our shared commitment to better serve the interests and well-being of the animals we care for. © 2019 James F. Gesualdi, P.C. The opinions expressed herein are solely those of the author. This is not, nor should it be construed as, legal advice. For more information on Excellence Beyond Compliance®, visit excellencebeyondcompliance.com. Academy Newsletters are archived at sdzglobalacademy.org. Click here for the Academy Newsletter Archive page.